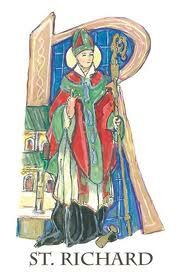 St. Richard was born in Wyche (Worcestershire) England in 1197, the son of landed nobility. His parents died when Richard was young and left their estate to his older brother. Stories told about Richard say that the family’s properties were neglected and fell into disrepair, but through discipline and excellent management, young Richard restored the estate. Out of gratitude for his perseverance and hard work, Richard’s brother proposed transferring the property to him. However, he refused the offer, preferring to study at Oxford University in England and at a university in Paris. Some accounts say that he earned a doctorate in law at Bologna, Italy. He later returned to Oxford, where his reputation as a scholar and teacher earned him the title of chancellor of the university in 1235. He administered the university with such energy that he came to the attention of one of his former tutors, St. Edmund of Abingdon, who was archbishop of Canterbury. He appointed Richard to be his diocesan chancellor. Edmund, who was a reformer dedicated to upholding the rights of the Church, became involved in several quarrels with King Henry III and eventually went into voluntary exile in France. Richard became known for his refusal to accept bribes and favors from suitors to the archbishop’s court, and accompanied him to France. Following the archbishop’s death in 1240, Richard moved to Orleans and after two years of study with the Dominicans and was ordained a priest in 1243. He returned to England and worked as a parish priest until the new Archbishop of Canterbury summoned him to become diocesan chancellor again. Richard became involved in the politics of the time when the archbishop had him elected Bishop of Chichester over the candidates proposed by the king. Because of this, the king refused to recognize Richard. Both the Archbishop of Canterbury and the king appealed to Pope Innocent IV who decided in Richard’s favor and consecrated him bishop at Lyons in 1245. The angry king still refused to accept the decision and decreed that no one should assist the new bishop to the point of refusing him even shelter. Until the king recognized Richard two years later, he lived in the house of one of his priests and visited parishes throughout his diocese on foot. In his more than seven years as bishop, he became known as a reformer. He insisted that the clergy of his diocese adhere strictly to discipline, aided the poor, and fearlessly denounced the corruption and vices of the contemporary Church and the royal court. Personally, Richard lived an austere life marked by almsgiving and works of mercy. He continued to be a very capable administrator and made certain that his clergy had suitable places to live as well as increasing the revenues of the diocese. Richard established guidelines for his clergy that included their responsibility to understand the sacraments and instruct the laity on their meaning, the importance of understanding and speaking clearly and reverently the words of the Mass, and the value of carrying out their duties properly and without personal gain. Richard died in Dover, England on April 3, 1253 while preaching a crusade to increase people’s devotion to God. He was canonized in 1262.